If you have not yet registered to vote, grace period and same day voter registration is available in Illinois! You will need two forms of ID with at least one that shows your current address. Check your voter information, learn whether you qualify, or locate your precinct in Illinois municipalities or Chicago. Early voting is open daily until April 1st in Chicago and have various schedules in other Illinois municipalities. Skip the lines and vote on your own time by checking early voting details for Chicago and Illinois. SAAPRI encourages all South Asians to take the polls during this early voting period. With hundreds of elections taking place across Illinois, get to know who you are voting for by obtaining your municipality’s ballot or candidate list from your local or county board of elections. Voter guides like BallotReady can also provide easy access to your ballot by providing your address. Voter guides include policy positions and values of candidates. The South Asian population is growing rapidly in Illinois municipalities, with many South Asians entering races in the city and suburbs. 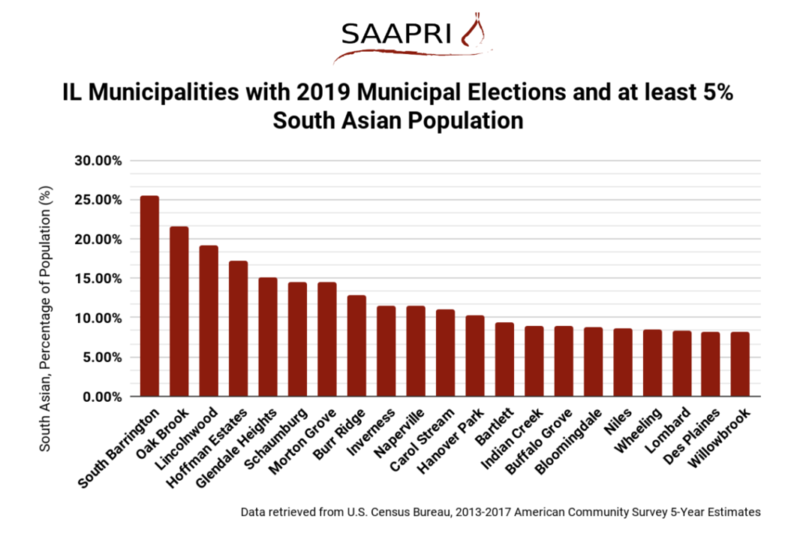 For detailed information and to see if your municipality has at least a 5 percent South Asian population, check out the facts and figures in our latest 2019 election report. We looked at data from 146 municipalities with elections in 2019, including 124 in Cook County and 42 Illinois municipalities. With over 52,000 South Asians in Chicago alone, our community has immense power to influence this year’s elections. SAAPRI’s research was mentioned in a recent article discussing the South Asian impact on local elections. Join the South Asian Civic Engagement Coalition this weekend to get out the vote with our local Asian American communities! There will be phone banking and canvassing opportunities on March 30th and 31st at 1pm and on Election Day on April 2nd at the Indo-American Center! Please contact Samay at sgheewala@indoamerican.org or (773) 973-4444 ext. 107 for additional details. SAAPRI has continued to organize civic engagement workshops focused on political participation and the upcoming elections with Asian and South Asian student groups in the Chicagoland area. We joined the University of Chicago South Asian Students Association on February 19th to phone bank with students and partners and look forward to engaging with our student networks at future events!